So you want to buy a Mora knife. The problem is, you visited a web store and found dozens of models. To make matters worse, it was hard to see any difference at all between them. 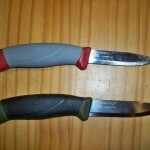 In this article, we explain the differences between the most popular Mora knives. At first glance, all Moras seem almost identical. But if you put them side by side, you begin to see the subtle differences emerge. Those differences get even more pronounced when you actually put a knife in your hand and begin working with it. As similar as they might seem, if you grab two different models, one will fit your hand and technique much better than the other. So how do you figure out which model will fit you best? Especially when there are, literally, dozens of models, old and new, floating around in web stores? Well, the first step is to take a very short look at the Mora’s evolution. Mora of Sweden? Morakniv? Frosts? Eriksson? Mora is a town in Sweden, made famous by its Scandinavian-style knives. 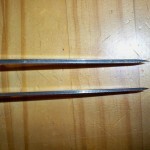 The term Mora has come to mean the specific style of knife produced in Mora. 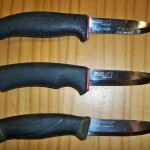 Historically, two major knife makers manufactured knives in Mora: Frosts of Mora and KJ Eriksson. Those two companies recently merged into a single company called Mora of Sweden or Morakniv with a unified line of knives. All of these names still get thrown around interchangeably and older models under the Frosts or Eriksson names still pass through online stores. It doesn’t matter what name is stamped on the knife. The quality has been consistent for decades. Companion? HighQ? 711? #1? Over the years Mora has produced a dizzying array of product lines. To make matters worse, for the last decade or so, the product lines have undergone a few name changes, so the same knife might show up under any number of different names. The classic Mora — the birch-handled knife that’s been continuously produced for over a century — came in just a few varieties, called #1, #2, #3, etc. When Mora began expanding its product line with rubber- and polymer-handled options, the product names shifted to numbers like 711, 840, etc. Fast forward to the emergence of Mora as a growing favorite around the world. The number system gave way to a slightly more descriptive (but still too enigmatic) naming system, with names like the Craftline, HighQ, and Allround. The year 2016 arrived with some significant additions to the product line, and along with those additions, a simplification of the product names. A tiny handful of the most revered numbered models still survive, but now the product names correspond with easier-to-understand product lines. How are the Mora Product Lines Determined? Interestingly enough, the product lines aren’t based on blade differences. True, a given product line will favor a particular blade. But at the end of the day, the product lines appear to be based solely on handle style. Let’s take a quick look at the blade variants and, more importantly, the handle variants. You’ll find surprisingly little variation between the Mora blades compared to other knife brands which tend to offer wildly different shapes and sizes. In fact, at first glance, Mora blades all look the same. At least, that’s true when you’re staring at them in your hand. But put them to use in the field and you’ll feel the differences immediately. Almost all Mora blades measure out to one of four lengths: ~3.5″ (91mm), ~3.75″ (95mm), ~4″ (104mm), or ~4.25″ (109mm). Blade thicknesses also fall into three groups: 0.079″ (2mm), 0.098″ (2.5mm), and 0.125″ (3.2mm). With the thickest blades at 1/8″, there are no sharpened pry bars from this brand. Still, these are hard-use knives that will take a beating. On the other hand, the medium-thickness blades, at 3/32″ (2.5mm), have been favored for years because of their strength in splitting wood coupled with their ability to take thin slices. As all-purpose knives go, these are hard to beat. Blade heights likewise keep within a fairly narrow range, between 5/8″ (17.5mm) and 7/8″ (23mm). This is supposed to create even better slicing and cutting performance while still giving you a portion of the blade for heavier-duty work. It’s easy to notice a fairly high correlation between blade styles and product lines, but not a perfect correlation. Some product lines will use more than one blade style. So don’t assume, for example, that all knives in the Companion series have identical blades. It’s also important to note that while, once upon a time, almost every Mora model came in both carbon and stainless versions, Morakniv has started favoring stainless more and more. For example, the extremely popular Companion product line only has two versions in carbon steel. If there’s a visible difference between the Mora product lines, you’ll see it in the handles. 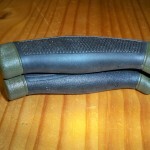 One note about Mora handles. Even though these knives seem like plastic-handled toys, once you start working with them you will be surprised not just about the toughness of the handles, but also at the handle ergonomics and geometry. Subtle features like a lightly flattened spot for the thumb on the top of the handle or a gentle palm swell go a long way in making these knives feel like an extension of your hand. These are thoughtfully-designed tools made for heavy use, just like your screwdrivers and chisels. They’re not meant to be eye-candy. By and large, this handle style designates a “high-end” Mora with a much steeper price tag. Knives with a Bushcraft handle tend to fall in the middle of the price range. 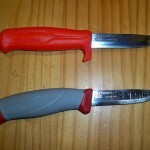 Mora considers the Companion its entry-level product line. Knives at this range and lower have been the models that defined the Mora brand and they remain the models that dominate sales. To whatever extent possible/reasonable, I have also included older model names. This will help you correlate your favorite old model to the current model, or help you see how that old model on eBay compares with the current product lines. Sorry, not every older model shows up in the list. I could only include the ones I actually own or could find specs for. If you have info I lack, feel free to pass it along. Ok, without further adieu … here we go. At the other end of the spectrum we have the unusually-long models. The 731/748 date back many years (obvious from being numbered models). They are identical, except the 731 was in carbon and the 748 is in stainless. If you didn’t catch that, the 748 is still in production, which must say something about its popularity, while the carbon 731 has been discontinued. They feature a pebble-textured, over-sized grip that feels great in the hand. Are There Any Other Mora Models? Oh yeah. So, so, so many other models. We’ve only focused on the basic field knives. Morakniv produces an impressive line-up of highly-specialized knives for everything from wood-carving to rope-cutting to fish filleting to wire-stripping. It has blunt-nosed models for ocean rescue and even a model dedicated specifically to harvesting mushrooms. Really. If you have a need, Morakniv just might have a knife to fill it. 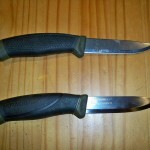 In recent years Mora has released more and more “high-end” models aimed at the bushcraft/tactical market. These come with new blade geometry and better sheaths, and they also carry a significantly bigger price tag. Personally, I don’t own any. While I’m sure they’re top-notch knives, to me they fall outside the range of the quintessential Mora — a high-quality throwaway knife. If they intrigue you, by all means, pick one up. But also pick up a few of the classic Moras — the Companion, the Pro, and the Basic. You might be surprised how often you reach for the “beater” instead of the Cadillac. Out on the knife and bushcraft forums, you see fans of every blade size and geometry. So we can safely conclude that real-world users are split on the best blade size. I’d recommend you get one of each and see which suits you best. My favorite is the now-discontinued HighQ Allround in carbon, which lives on my belt when I’m in the outdoors. The comfortable grip and responsive blade size make this knife feel like part of me. It has enough blade to be useful, but not so much that it ever feels cumbersome. When I feel like I want a little more blade, I grab the Companion MG in carbon since its handle matches the HighQ’s perfectly. It’s like swapping blades without swapping handles. If you haven’t gathered, I prefer carbon Moras. I keep a Robust in my fire building kit for splitting kindling and another in my FJ. The thicker blade can take a pounding and the ample grip makes people feel comfortable using it. Where Do I Buy a Mora Knife? I’ve never seen a Mora in a local store. So unless you’re luckier than I am, you will have to buy online. Two vendors that I’ve had good dealings with are Ben’s Backwoods and Ragweed Forge. I give the nod to Ben’s Backwoods because of their quick service and less-primitive ordering system. These stores have a lot of enthusiasm for Moras. They’ll give you great advice and great service. Also, Amazon can be your friend. You will find almost every Mora knife there thanks to third-party sellers, many of whom are mom-and-pop stores with as much enthusiasm for the outdoors as you have. When I was pulling some of these knives out for the review, I noticed an old invoice crumpled in the bottom of the storage box. The total on the invoice caught my eye: $55. Turns out it was $55 for five knives. That’s when it hit me again how cheap these knives are — cheap, but with outstanding quality. This is a bargain that comes along so rarely that you can’t help but get excited about it over and over again. So budget yourself $40-50 and get an assortment of Moras. None of them will disappoint you, and one of them will probably thrill you.